We often get asked, "What resources do you have for moms?" Our answer will include our curriculum called Understanding Dad™ and our Pocketbooks for Moms™. But now, there's more! We're excited to share two new resources designed specifically to help moms work with dads. Most importantly, we created these two new resources based on feedback from practitioners like YOU! Check them out below, and start using these Tip Cards to supplement your program today! Effective communication can be one of the biggest challenges for couples, and especially for those who are separated and co-parenting. 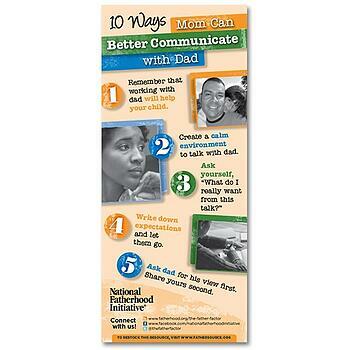 This tip card equips mom with ways she can better communicate with dad for the benefit of her children. Please visit here for more details. $13.99 for Pack of 50. Co-parenting takes both parents' commitment and involvement. This tip card provides mom with simple tips for being a good co-parent - all for the benefit of her children. Please visit here for more details.$13.99 for Pack of 50.